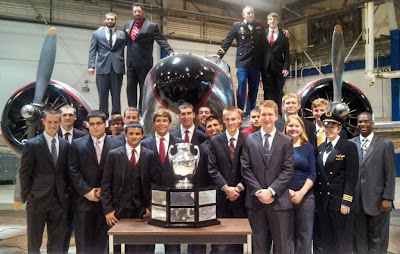 Every year the National Intercollegiate Flying Association (NIFA) awards the Loening Trophy to the best overall aviation program in the United States. The panel of judges vote on a series of presentations held at the annual national flight competition and these are presented by flight teams from all over the country. This past year, the aviation program at Lewis University emerged number one. 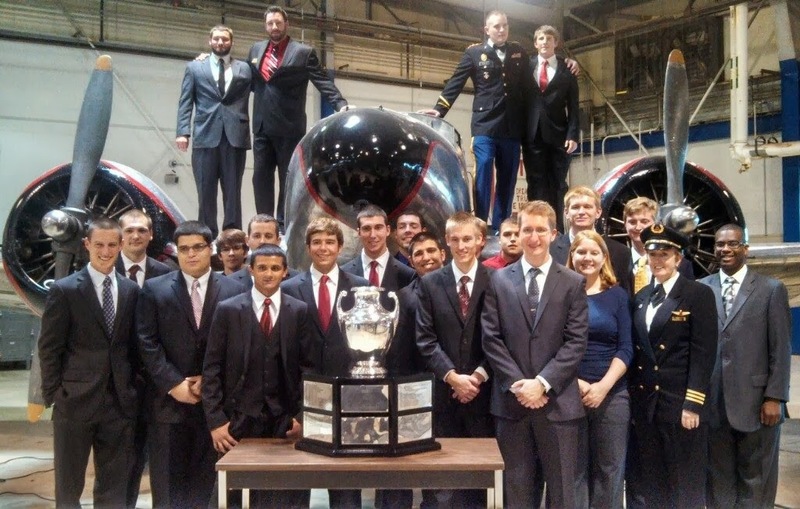 The Loening Trophy is a perpetual trophy presented annually to the outstanding all-around collegiate aviation program in the nation. 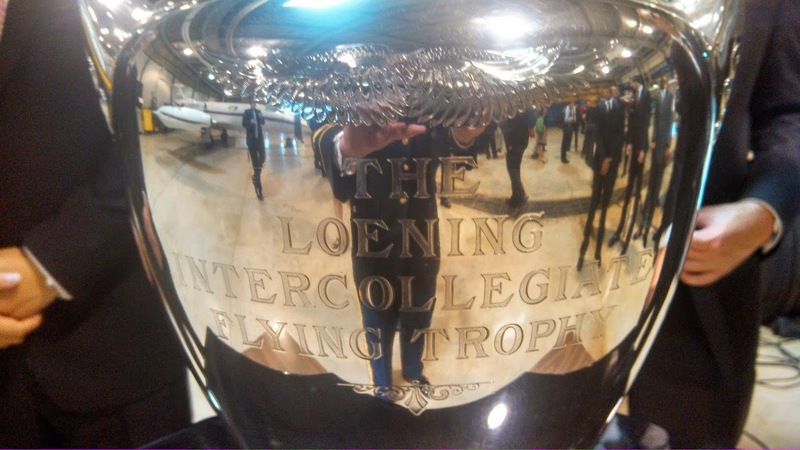 The Loening Trophy is the rarest and oldest of all collegiate aviation awards. 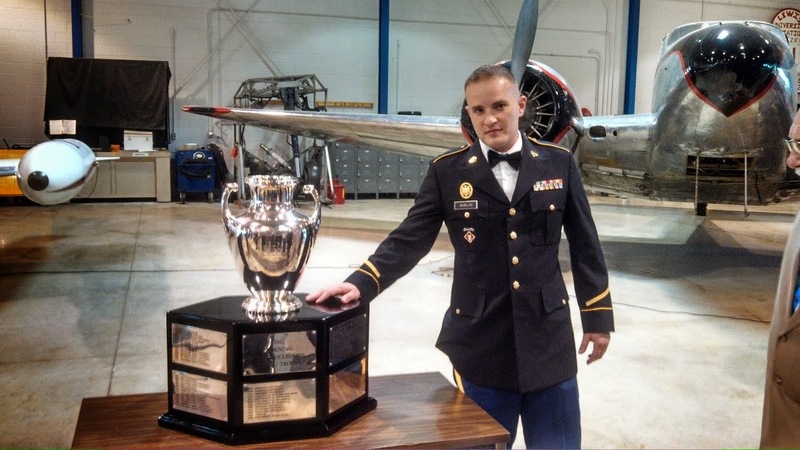 The pure silver Tiffany designed trophy was commissioned and first awarded in 1929 when aviation pioneer and inventor, Dr. Grover Loening saw a need to annually recognize the most outstanding achievements of today's college aviation programs. Dr. Loening (first aeronautical engineer for the Wright Brothers), asked his friends and famous pilots, Charles Lindbergh, Amelia Earhart, and Navy Commander John Towers to assist him in judging the first competition. The original Loening Trophy is still awarded today and is considered the most prestigious award at the annual SAFECON competition. The award not only represents superb achievement in aeronautical skills, but more importantly represents the current benchmark for an overall outstanding collegiate aviation program. Emphasis on academics, community involvement, aviation skills and their advancement, a comprehensive safety program, and professionalism, when combined with a pro-active enhancement of the future of aviation are keys for the selection of this award. The award was presented to the school in an event held on September 26th of this year in the Harold E. White aviation maintenance hangar. The trophy was presented by Peter Bro (Chief Judge of the Loening Trophy Event, Director of Operations at the Museum of Science and Industry in Chicago, and Facility Director for the Future of Flight Aviation Center), Bob Clement (Captain at FedEx, President of the NIFA Foundation, President of Alpha Eta Rho, and Loening Trophy judge), Dolores Pavletic (Captain at FedEx, alumnae of Lewis University and Alpha Eta Rho, and Loening Trophy judge), Trine Clement (First Officer at Delta Airlines), and Anthony Johnson (Alpha Eta Rho’s National Executive Director). Below is a video of Lewis University's President, Brother James Gaffney, giving a speech at the ceremony. The presentation and the post-interaction with those that represented various facets of the aviation industry was a great experience. I'm also very fortunate to have known (and once upon a time been section mates with) the journalist who wrote the article in the schools paper. 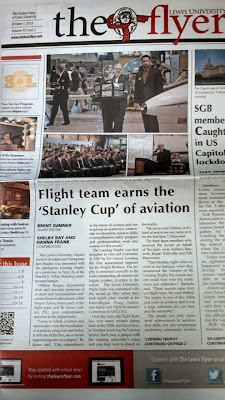 In the article, aptly titled "Flight team earns the 'Stanley Cup' of aviation" for what the Chief Judge had compared the trophy to, Brent Sumner did a wonderful job at capturing the history surrounding the achievement. The article is pictured below. "Mr. Speaker, I ask my colleagues to join me in recognizing Lewis University’s Aviation and Transportation Department and congratulating them on the award they received. This honor proves that Lewis continues to be a collegiate aviation leader not only in Illinois, but nationwide. May the students and faculty at Lewis enjoy this prestigious award and continue their work in the field of aviation." This award makes me very proud to both work for the Lewis Aviation department and to be a graduate student in the program. I'd like to end this by congratulating the Lewis University aviation staff who are constantly developing the program, the members of the Lewis University Flight Team who presented the program to the panel of judges, and finally to the aviation students who have excelled in their academic work and the pursuit of their chosen professions. Good job Lewis Aviation!